Companion products: Regal Skin Care Remedy to soothe itchy and irritated skin from the inside out Regal Skin Care Biscuits are a tasty alternative to Regal’s Skin Care Remedy Regal Skin Healing Spray to soothe itchy, red, raw and irritated skin caused by allergies or infection. What is Regal Skin Healing Shampoo? 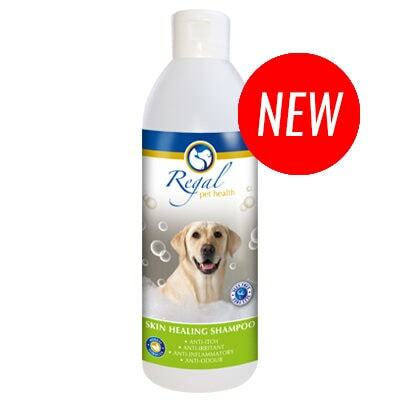 Regal Skin Healing Shampoo has been formulated to offer soothing, healing and calming relief for itchy, irritated and inflamed skin. Suitable for dogs of all skin types, including those with sensitive skin, this Sodium Lauryl Ether Sulphate (SLES) free shampoo will assist with relieving allergic skin reactions, healing skin complaints and reducing skin odours. The shampoo has a pH balance of pH7 to promote healthy skin in dogs. 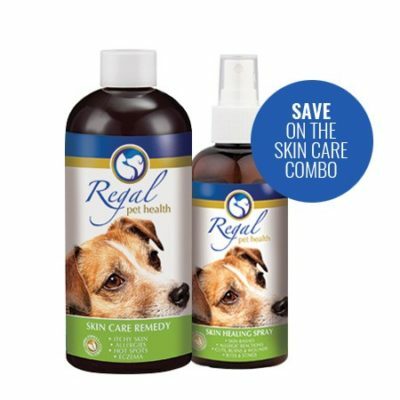 Can I use Regal’s Skin Healing Shampoo together with the Skin Healing Spray and the Skin Care Remedy? Yes, you can use these products together. 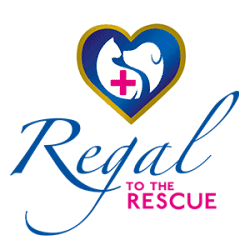 The shampoo is a complementary product to the Skin Care Remedy and along with other products in Regal’s skin care range these products work to offer a comprehensive, holistic solution for treating skin problems in dogs. Bathing a dog with itchy skin from allergies can be soothing and help reduce itching. The shampoo formula is pH-balanced and cleans and conditions the coat while fighting the problem of itchy skin, reducing skin odours and healing skin complaints. This product has been pH balanced to pH7. Family: Aloacae, native to Africa. Aloe gel is widely used for the external treatment of wounds, burns, seborrheic dermatitis, psoriasis, fungal infections and skin inflammations. Modern clinical use of the gel began in the 1930’s with successful treatment of radiation and X-ray burns. Since the 18th century aloe was used to treat various horse ailments – hence the name “horse aloe”. Two blacksmiths named G. Skevington and F.D. Day published their findings in 1940 listing their successes treating horses for allergic skin conditions, summer eczema and other conditions. Clinical studies indicate that aloe accelerates wound healing by directly stimulating macrophage and fibroblast activity (Davis 1994). The gel has hydrating, insulating and protective properties. The constituent allantoin enhances epithelialization (cell growth over wounds) in suppurating wounds and resistant ulcers. A moisturising, healing. anti-irritating, and non-toxic chemical compound useful in cosmetic, dermatological and veterinary preparations. It is an effective cell proliferating agent that repairs damaged cells. Also has a skin softening (keratolytic) action and acts as a chemical cleaner of wounds and ulcers. It heals by covering the affected areas with new skin (epithelialization). Allantoin is naturally present in foetal allantoic fluid, dog urine, urine of pregnant women, rice polishing, comfrey roots, wheat germ, organic soil, aloe and even in earthworm. It was first mentioned in 1838 when it was discovered that uric acid could be oxidised to allantoin. Allantoin both in its organic and synthesized form, is a safe, non-allergenic and non-toxic chemical compound. It is very useful for protecting the skin as well as treating skin conditions. It is the ammonium salt of dark sulfonated shale oil used successfully as an active pharmaceutical ingredient of natural origin and has been used for more than 100 years in the treatment of skin disorders. The anti-inflammatory, anti-bacterial, anti-mycotic actions of Ichthammol and anti-seborrheic (sebaceous gland regulating properties) offer a broad spectrum of efficacy and constitute the basis for successful application of this active ingredient in the treatment of different painful skin disorders with and without microbial background. It is also kerastatic in action which normalises enhanced cell renewal as in the case of scaling and dandruff. In human and veterinary medicine Ichthammol belongs to the few exceptions of well documented active ingredients of natural origin. The dark sulfonated shale oil is manufactured by Osterichische Ichthyol in Seefield / Austria according to the requirements of different pharmocopoeias (e.g. Ph.Eur). Water (aqua), Cocamidopropyl Betaine, Acrylates Copolymer, Glycerin, Trehalose, Cocamide DEA, Polysorbate 20, PEG-75 lanolin, Phenoxyethanol (and) Ethylhexylglycerin, Fragrance (parfum rooibos), Sodium hydroxide, Potassium sorbate, Citric acid. WARNINGS: For external use only. Keep out of reach of children. Avoid the eyes. Rinse immediately if contact with eyes. If serious skin conditions or skin irritations persist, consult your veterinarian. Brush coat to remove matted hair and dirt. Wet coat thoroughly with warm water, apply shampoo evenly and massage to a good lather. Keep away from the dog’s eyes. Rinse thoroughly with warm water ensuring that all shampoo residue has been removed. Towel-dry and brush the coat. For best results use once a week. Can be used on an ongoing basis. For external use only. Keep out of reach of children. Avoid the eyes. Rinse immediately if contact with eyes. If serious skin conditions or skin irritations persist, consult your veterinarian. Is Regal Skin Healing Shampoo SLES free? What does that mean? Yes, it is SLES free. SLES is Sodium Laurel Ether Sulphate. This is a chemical used in thousands of cosmetic products, as well as in industrial cleaners. It is present in nearly all shampoos, scalp treatments, hair colour and bleaching agents, toothpastes, body washes and cleansers, make-up foundations, liquid hand soaps, laundry detergents, and bath oils/bath salts etc. Because the dog’s skin is more sensitive than a human’s scalp, it’s important to ensure the use of dog specific shampoo’s to avoid the irritation of skin or a flare up of an existing skin condition. By removing SLES from the shampoo, you reduce the chances of irritation occurring. How do I maintain the pH levels of my dog’s skin? The pH levels of your dog’s skin are important because an imbalance in these levels can cause no end of skin problems, leading to a breeding ground for bacteria, parasites and viruses. According to petmd, the normal range of skin pH levels for humans is 5.2 to 6.2 (more acidic) and for dogs, depending on size and breed, it is 5.5 to 7.5 (which is more alkaline). Also, a dog’s skin is much more delicate as it is only 3-5 cells thick (in humans it is about 10-15 cells thick) and hence very susceptible to bacteria if this balance is not maintained. To maintain the pH levels of your dog’s skin it is vital to use dog-specific shampoos because they are formulated specifically with your dog’s pH levels in mind (check the box before purchasing to make doubly sure). Human shampoos are designed to replenish and moisturise skin according to our human pH levels, and if we use these on our dogs, it will upset their delicate skin’s pH balance, leaving them vulnerable to infection and disease. Infections will then lead to a further deterioration in your dog’s skin condition, which in turn leads to more washing, and if you continue with the incorrect soap, it soon becomes a vicious cycle. For more info on maintaining the pH levels of your dog’s skin, click here. There is no definite guideline as to how often you should wash your dog. Some breeds have longer hair and prefer outdoor play which means their coats will accumulate more dirt than an indoor dog. So the idea is to wash your dog when he is dirty or smelly. As a general rule some veterinarians recommend you bath a dog with normal skin once a month. Often, regular brushing will go a long way to keeping the dog’s coat and skin in good condition, reducing the need for frequent baths. Note, you CAN wash your dog too much! Washing your dog too often can strip the skin of the essential oils needed to rejuvenate the skin cells, which can cause skin problems. If your dog suffers from skin problems, it is best to seek advice from your vet on how often you should wash your dog, and whether you should be using a medicated shampoo specifically for problem skins. My dog has oily skin – how often should I wash him? Oily, greasy fur is most commonly diagnosed as a condition known as seborrhoea, but check with your veterinarian before embarking on any treatment. There are many reasons your dog may suffer from seborrhoea, from diet to allergies, to parasites, and certain breeds are more prone than others. An awful rancid smell is often accompanied with this kind of condition. Medicated shampoo is often the suggested treatment but consult with your veterinarian as to which one would be best for your dog’s breed and condition. Benzoyl peroxide is the most common ingredient to treat oily skin as it lifts the oily scales and also has anti-bacterial and anti-itch properties. Each shampoo differs as to how often you should bath your dog- it also depends on the severity of the condition – but it is more often than not a few times a week, until your dog’s condition improves. Most of the shampoos recommend lathering and then leaving the shampoo on for at least 10 to 15 minutes, before rinsing well, but be sure to follow the directions on the bottle. My dog has dry skin – how often should I wash him? Dry, flaking skin can also be diagnosed as seborrhoea (see above) but again, before you treat your dog, consult a veterinarian to determine the exact cause. If seborrhoea is diagnosed, medicated shampoo can certainly help – simply follow the directions as to how often shampooing should take place. Also look for shampoos or products that contain soothing ingredients such as natural, moisturising ingredients like shea butter, aloe and oatmeal. Washing your dog too often – especially with the incorrect soap – can also cause dry, itchy skin. Also his diet and lifestyle could be contributing factors. Make sure he is eating quality dog food, is well hydrated, and brush him regularly (to stimulate cell renewal). If all else fails, take him to the vet to rule out anything more serious, in which case medication might be necessary. How do I wash my dog properly? Dogs seldom enjoy bathing. It is recommended that you teach your dog to associate bathing with having fun, and also to take it slow. Each dog is different, so find what works for you, but here are the general guidelines for washing your dog. Unless it’s a warm, sunny day, bath your dog indoors in the bath or tub. Brush your dog thoroughly, getting rid of excess hair and working out any matted fur. Put a mat in the tub, so your dog won’t slip. Put cotton wool in his ears to protect them from soap and water entering and causing possible infection. Place your dog in the tub, holding firmly to both secure and reassure him – keep the collar on for added grip if necessary. Wipe his face with a damp facecloth, making sure you clean all facial folds. Saturate your dog’s fur and skin with lukewarm water, separating the fur to get to the skin if necessary. Lather him with specially-formulated shampoo for dogs, being sure to follow the directions on the bottle. Using your hands, work your way section-by-section down the chest, under the tummy and along the legs, and tail. Avoid the face/eye/ear area. Leave the soap on for the recommended amount of time. Rinse thoroughly (soap left on the skin will irritate the skin even further). Dry thoroughly with a towel. Most dog’s shy away from hair dryers, but if yours is a fan, these also work. Clean the inside and the outside of his ears, removing any debris or wax with cotton balls. If your dog is a big producer of ear wax, you might want to invest in some ear-cleaning solution. Once dry, brush him again. The idea is to remain calm, yet assertive throughout bath time while at the same time making it fun – so your dog associates bathing as a positive experience. Is it important to wash my dog if he/she suffers from skin problems? Washing your dog incorrectly could be the cause of your dog’s skin problems. Are you using dog-specific shampoo? Are you washing your dog too frequently? Are you using the incorrect soap for your dog’s particular skin condition? You’ll first need to ask yourself all these questions. If you can rule out all of the above, then yes. Certain soaps are specifically formulated for problem skins so the key is to consult your veterinarian for expert advice, and be sure to follow the instructions as to how often you should be bathing your dog with the desired medicated shampoo/soap. Does washing my dog dry out the skin? Yes, if the incorrect soap is used and you wash your dog too often, it can. Do I need to use a conditioner on my dog’s coat? If you follow the basic grooming principles above, your dog is consuming a healthy and nutritious diet and his skin and coat is generally healthy and shiny, it is not necessary to use a conditioner. However, just like in human hair, using conditioner on dogs can leave their fur silky and tangle-free. Depending on how often you bath your dog, it not necessary to condition after every shampoo, but if you do decide to use it consider using a natural dog-specific conditioner which contains vitamin E – this is soothing to both skin and coat. Make sure you follow the product’s specific directions on how to use and rinse thoroughly after use, as any remnants can irritate the skin. Would you like to know more? Read more articles and Q and A’s under Dr. Megan Kelly’s TOP TIPS for a healthy skin and shiny coat. Regal Tick and Flea Shampoo has been formulated with Khakibos and Rosemary to offer a herbal solution to tick and flea infestation. Suitable for dogs of all skin types, this Sodium Lauryl Ether Sulphate (SLES) free shampoo has a pH balance of 7 to promote healthy skin in dogs. 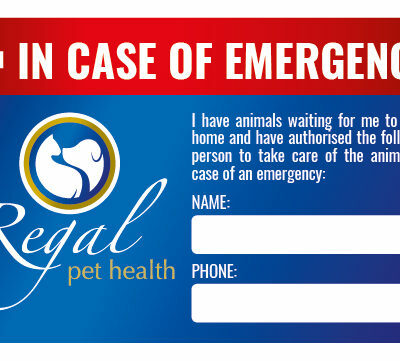 We at Regal are always thinking about your pets. We know how important their wellbeing is to you so what better way to ensure their safety than a personalised emergency card. 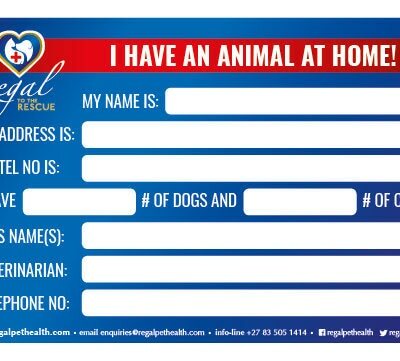 Get your ICE – In Case of Emergency – card today so that you can rest assured your pet will be taken care of in any situation.